One of the greatest German defenders. Munzenberg started his career as striker but soon was moved to defence where he impressed on centre half and left back position. 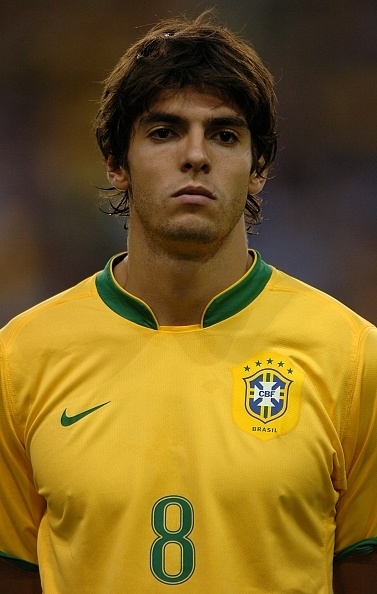 He was very strong player with fantastic heading abilities, athletic built with enormous determination and fighting spirit which often led to red cards. Maybe not elegant but surely very effective. Very tough but also knew to make very good crosses, endurable player who was also solid scorer, I've read he scored about 100 goals for his club. Reinhold Münzenberg moved as a young man from Aachen's Association for the Tivoli and made his debut at age 17 in the first team where he contributed as a right winger for the first league. The big breakthrough came in the following years at the center half position from which he led the Alemannia from the crisis to the Rhine district championship 1931. On 07/09/1930 he played in Copenhagen, the first of 41 international matches. An own goal in the 0-1 Germans in Paris threatened to end his international career prematurely, but in 1934 he was-nominated for the World Cup in Italy and celebrated with a victory in the 3rd place match against Austria's biggest success. Münzenberg took part in the Olympic Games in 1936 and was a member of the legendary "Breslau-Elf", which remained unbeaten in twelve games in 1937. Together with Paul Janes of Fortuna Düsseldorf, he was a hardly surmountable Verteidigerduo that even legends like Stanley Matthews prepared a headache. 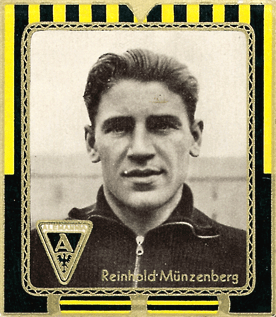 At the 1938 World Cup Münzenberg was again in the squad, but was not used. In the same year he celebrated his greatest triumph: the Alemannia, as he with the team for outstanding performance led Gaumeisterschaft. "Like a giant tree that stood in the Aachen penalty area and pushed himself - with his head and chest and legs - against the flood of Bonn attacks," wrote the West German sports observer after a 1-0 win over TuRa Bonn. On the final day 0-0 against SV Beuel to reach the final round gave the German championship. "Against this fighting machine is in its perfect recklessness not to come," the press Beueler summarized in a mixture of admiration, outrage and resignation. Ever had "the Iron" because of his uncompromising playing style as well as attraction stimulus figure, by the opposing crowd he was not booed and insulted often. As a referee in the following season as couched an example, and Miinzenberg was blocked after a sending-off and subsequent riots nine weeks, the Alemannia could not compensate for the loss and dismounted. Münzenberg Alemannia remained faithful until the end of career, the only war he progressed in the meantime to northern Germany. With the Air Force SV Hamburg, he was vice-champions in 1943 and 1944 German runner. At the age of 42 years, played his last game Münzenberg Reinhold for First-Alemannia, but remained active in the tradition of self, jumped several times as the interim coach and led the club from 1974 to 1976 as president through hard times. On 6/25/1986, a few hours after watching the dramatic World Cup semi-final Germany-France, Reinhold Münzenberg died of heart failure. Over 60 years he was a member of the association and an incentive for generations of the Alemannia. Das 3:2 erzielte Münzenberg mit einem Freistoß aus 40 Metern. Probably SP could be raised a little bit..
Für Alemannia bestritt er weit über 1000 Spiele, in denen er auch eine ganze Reihe Tore erzielte. Ein Abwehrspieler als Torjäger? Bei Alemannia spielte Münzenberg immer Mittelläufer. "Wissen Sie", so sagt er, "das war damals etwas ganz anderers als heute. Ich spielte immer einen offensiven Mittelläufer. Unsere Spielanlage mit dem WM-System ist eben nicht mit den Spielsystemen von heute zu vergleichen. Und wenn sich mir von meiner Position im hinteren Mittelfeld eine Chance bot, mit nach vorne zu gehen, nutze ich sie. Und dabei erzielte ich auch das eine oder andere Tor." Updated. Updated also all my players in '30s and some players under the command of pesman, el mago which I created with his help or assisted with suggestions on the previous sites like Italian players from Peppino and French players from Kaoimhin..